Suspected right-wing extremists vandalised the Latrun Monastery outside Jerusalem early on Tuesday morning, in the first “price tag” attack following the evacuation of Migron on Sunday. The vandals spray painted “Jesus is a monkey” and the words “mutual responsibility” along with the names of illegal outposts Upper Migron and Maoz Esther, in large orange letters on the outside of the monastery. They also burned the wooden door at the monastery entrance. The attack occurred at around 3:30 a.m. and was quickly discovered by the monks, who put the fire out and notified police. Jerusalem police spokesman Shmuel Ben- Ruby said that police immediately formed a special investigative unit to find the perpetrators. Eight policemen are assigned to the special unit, he said. Right-wing activists expressed mixed emotions to the attack. 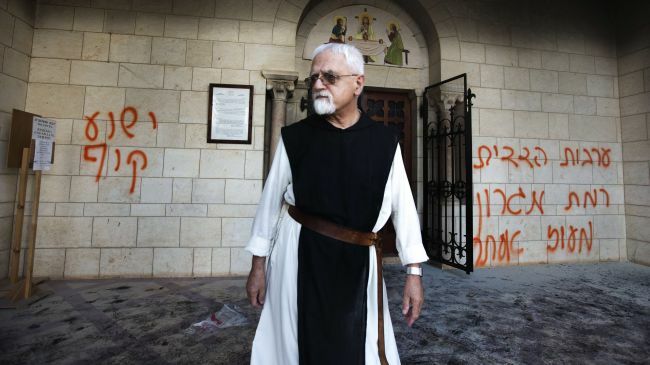 Activists with the right-wing organization Im Tirtzu expressed their outrage at the incident and traveled to the monastery on Tuesday afternoon to clean off the graffiti, bringing flowers for the monks. “This must be fought with an iron fist, and we must put an end to these severe phenomenons that stain the name of the State of Israel. We are obligated to uproot this phenomenon,” Barak added. “What is going on in Israeli society today that permits Christians to be scapegoated and targeted by these acts of violence?” the group asked in a statement to the media. “This is a beautiful monastery which Israelis have visited for decades. The fact that it was hit by vandals indicates extreme hatred [by the attackers] for anyone and everyone, regardless of their political position,” she said. Yacimovich added that the attack was committed by “an extreme minority that does not represent Israeli society, and not even the majority of settlers. Several interfaith groups spoke out against the attack, including the Council of Religious Institutions of the Holy Land, a body which represents the Chief Rabbinate of Israel, the Palestinian Authority Wakf and Religious Affairs Ministry and The Heads of the Local Churches of the Holy Land. “The council calls upon people from all faiths – Christians, Jews and Muslims – to respect all holy places and sites for all three religions, and strongly discourages extremists’ behavior that exploits or involves religion in a political/territorial dispute,” the group said in a statement. Following the evacuation of Migron on Sunday, Judea and Samaria District commander Asst.-Ch. Amos Yaakov said police were preparing for increased price-tag incidents. “I assume that there will be an increase in price-tag incidents, and we have carried out preparations for this,” Yaakov said on Sunday. According to Ben-Ruby, this was the first attack against the Latrun Monastery. However, it was not the first time price tag vandals vandalized a Christian site. In December 2011, two United Arab List-Ta’al MKs, Ahmed Tibi and Ibrahim Sarsour, proposed a bill that would impose a mandatory six-year sentence on anyone found guilty of vandalizing a house of worship. The Latrun Monastery of the Silent Monks was a waystation for pilgrims on their way from Jaffa to Jerusalem in the 19th century. The current building was constructed in 1890. Until 1960, monks living on the premises took a vow of silence and only spoke during prayer. Today the monastery is open to the public during select hours. Ben Hartman, Yaakov Lappin, Gil Hoffman and Jerusalem Post staff contributed to this report.